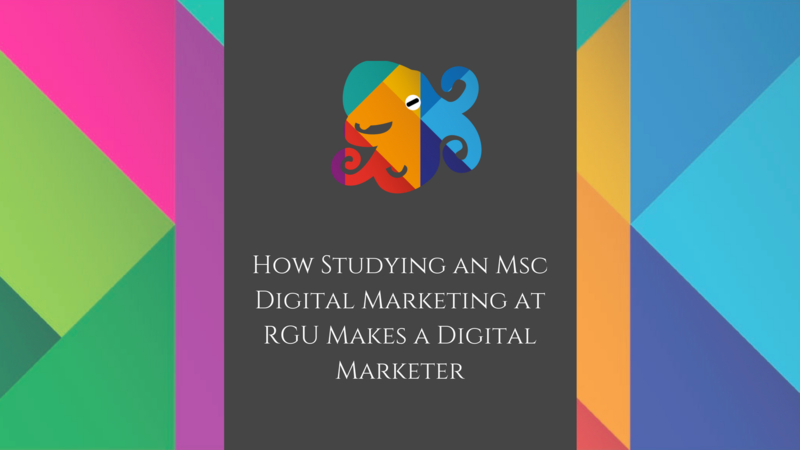 April 13, 2018 April 13, 2018 by Emma S.
Over the years the MSc Digital Marketing cohort has not only learned the theory behind digital marketing, but have also put the theory into practice by means of The Digital Scot. From creating blog content to social media marketing and launching new innovative projects, The Digital Scot sets students up for a lifetime career in the industry. This degree was crafted to fill the gap between normal marketing practices and the new age of digital marketing, so you can be sure that the Institute of Direct and Digital Marketing have ensured it aligns with the real world outside of the classroom. From learning the key components involved with Digital Marketing Strategy and creating your own content for campaigns in Digital Production Tools and Techniques to developing the fundamentals of Digital Public Relations and how to access and research information in Methods, Metrics and Analytics. Year on year the Digital Marketing cohort work with real-life clients and industry experts to hone in on knowledge and skills developed throughout the year. These relationships creating a lasting impression on students and help to provide the experience needed to further our careers. One such relationship gives the opportunity for a student to participate in a two-week placement program at the end of the year. Like the majority of postgraduate degrees, the course focuses its education over three trimesters with the first two trimesters being directed at learning the theory and best practices associated with the industry. The third trimester is purely based on the students putting all the learning into practice either by a written dissertation or a real-life project. For those that chose to do the course part-time the course is structured over three years with each of those years being aligned to one trimester. Having worked for organisations such as Peacock Visual Arts, Visit Scotland and of course Robert Gordon University, both Simone and Jack have an in-depth knowledge of all things marketing both direct and digital. With her experience being in strategy, Simone is the face of both the Digital Marketing Strategy and the Digital PR modules. Jack, on the other hand, focuses on the creative Digital Production Tools and Techniques module. Jack also fronts the Methods, Metrics and Analytics module in trimester 2. Alongside our amazing lecturers, we also have industry talks from working professionals such as Julie Brander, Dave Robinson, and Jason Stewart. It goes without saying that while all the rest of the list contributes to making a digital marketer only YOU can make it a reality. If you put in the time and the effort you will succeed and join the list of success stories that have come from not only The Digital Scot but the MSc Digital Marketing course as a whole. If we’ve got you hailing for more, sign-up to our mailing list or follow the link to our latest blogs. Alternatively find out more and apply for the course now at RGU.